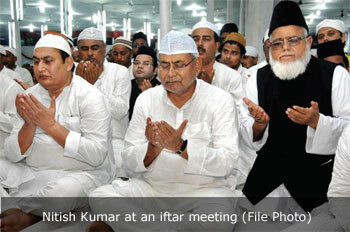 Nitish Kumar in year 2013 made new freebie, goodies announcements for Muslims and dalits. After releasing the government's report card, 2013, Nitish announced to increase the lifelong monthly pension to the families of 1989 Bhagalpur riot victims from Rs 2,500 to Rs 5,000. The state government had started a pension of Rs 2,500 for them in 2007. The CM also announced to increase the monthly payment to the volunteers managing the 10,000 Talimi Markaz, the preschool institutions for poor Muslims, and 20,000 'tola sevaks' running similar schools for mahadalits. Under the scheme launched in 2012-13, they were getting a monthly stipend of Rs3,500 which has been increased to Rs5,000. Apart from this, the CM announced to extend the scholarship scheme to all girls from class I to class X of government recognized madrassas for government financial aid. Nitish said Bihar government would implement the Food Security Act from February 1, 2014, and the government would finalize the list of beneficiaries from the final list of Socio-Economic Caste Census (SECC) and make ration cards available to them. In this context, he said every now and then the agencies hired by the Centre stop payment to the staff engaged in SECC work and announced that the state government would now make payment to them to avoid any delay in the list publication. Saying that the Right to Public Service Act was a good success not only in providing facilities to the common people but also in checking corruption, the CM said it was being regularly reviewed and the time limit for issuing income, caste and residential certificates had been reduced from three weeks to two weeks. "The limit will be minimized further and the general administration department has been asked to identify the services to help the needy people," he said and added that for certain services, Tatkal service would also be started. Nitish said, "The atmosphere of communal and social harmony created by the government in the state will not be allowed to be distributed at any cost. We have also faced several challenges and many more will come. But we will face them with patience."